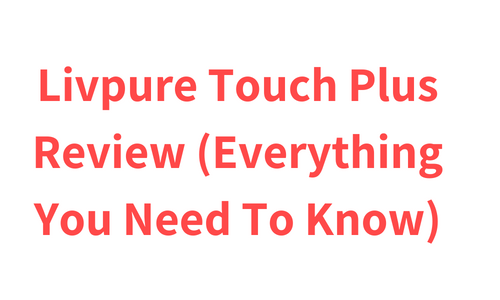 If you are looking for Livpure Touch Plus honest review then I must say you are at the right place. In this article I am going to share everything you need to know about this water purifier. Livpure Touch Plus comes with RO, UV and UF water purification technologies. Additionally, it also has taste enhancer. It completes its water purification in 7 stages. It comes with 8.5 L water storage tank and a good alert system. The unique part about this water purifier is that it does not comes with traditional tap for dispensing water, instead it has multi dispensing system. Livpure Touch Plus has unique trendy and compact look. This water purifier is made from Food grade plastic which is non-toxic and durable as well. All the parts are fitted perfectly and you will not see any kind of gaps between the parts. The front look of this water purifier is pretty clean. There is a small digital display and four buttons on the front side. This water purifier does not comes with a traditional water dispensing tap, instead it has buttons for dispensing water. Water dispensing pipe is located at the bottom of this water purifier. This water purifier completes its water purification process in 7 stages. The first stage of purification is consist of Pre filter. It removes visible impurities from the water like sand,mud and dust etc. 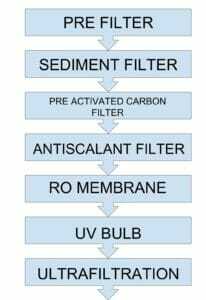 Second stage of purification has sediment filter which removes sediments and other suspended impurities from the water. 3rd stage has pre activated carbon filter. If you are getting water from Municipal water supply then it is usually treated with chlorine for the purification which forms harmful chlorine by-products in the water. And pre activated carbon filter removes such harmful chlorine by-products from the water. This filter removes pesticides, herbicides and bad taste and odour causing contaminants from the water as well. Fourth Stage of purification has antiscalant filter. This stage basically works as an Protector of RO membrane. It removes salts which could get deposited on the RO membrane and can form a layer. Removing such salts from the water before RO filtration increases the purification capacity and life of RO membrane. Fifth stage of purification is consist of RO membrane. RO membrane is consist of very tiny pores. Water is passed with a great force through the membrane. This membrane allows water molecules only to pass through it and blocks remaining dissolved solids and salts as well as heavy metals like Mercury, Arsenic and Lead from the water making it consumable and ultimately converting hard water into soft water. UV purification comes in at the 6th stages of purification. UV purification is consist of an UV bulb. In this stage water is exposed to the UV rays of the UV bulb which inactivates harmful bacteria and viruses making it microbe free. The seventh stage of purification is of Ultra filtration. This stage is consist of ultra filtration cartridge which removes remaining Bacteria, Cysts and Giardia from the water. It also removes remaining suspended particles from the water. With seven stages of purification Livpure Touch Plus has a solid solution for the purification of any kind of water. This water purifier comes with a water storage tank of 8.5 litre. It is made from Food grade plastic which is non-toxic at durable as well. This water purifier will notify you whenever you will have to change any of its filter. You can check the filter life anytime in the menu of this water purifier which is located at the front side of this water purifier along with the water dispensing buttons. The menu of this water purifier also has some additional features like, it can show you the quantity of water consumed and the quantity of water remained in the water storage tank etc. When you choose this option, the water purifier will dispense the water enough for filling a glass of water, after that it will automatically shut off the dispensing process. When you choose this dispensing option, then the water purifier will dispense the water enough for filling a water bottle and will automatically shutdown the dispensing process. As the name suggest when you choose this dispensing option, then the water will continuously start flowing until you stop it manually. Besides this three options this water purifier also comes with a manual valve for dispensing purified water. This water purifier also comes with a taste enhancer which basically enhances the taste of the water by adding essential minerals in it, which also makes the purified water healthy for consumption. Users like the design and build quality of this water purifier. Some users also like the multi dispensing options which this water purifier offers at the same time some user also found it inconvenient. As this water purifier only comes with a white colour option so you are buying option is limited. Now lets have a look at Pros and Cons of this water purifier. If you are looking for a completely unique water purifier then Livpure Touch Plus is a good choice for you. This water purifier has a very unique looks as well as it comes with multi dispensing options which makes it unique from others. The 7-stage purification is a solid solution for the purification of any kind of water. Also this water purifier comes with enough practical features like filter change notification, taste enhancer and some additional features like multi dispensing options. And this water purifier also comes with an 8.5 litres of water storage tank which is the regular capacity for RO water purifiers.